During the battle for Oosterbeek, near Arnhem, from 19 to 25 September, 1944, the estate “Gelders Hof” was a so called RAP (Regimental Aid Post) for men of the Border Regiment, who defended the western side of the perimeter. The house is situated at a the crossroads of the Hoofdlaan and the Utrechtseweg, right next to estate “The Brem” It therefore found itself exactly halfway between the frontline – about 100 yards away – and the Division Headquarters in Hotel Hartenstein. Captain J. Graham Jones commanded this first aid post. He was assigned to the 1st Batallion of The Border Regiment as the Regimental Medical Officer. As may be concluded from the name RAP, here the relatively lightly injured were taken care of during these last days of the desperate fighting in Oosterbeek. Whenever a soldier needed a more serious treatment, he was carried to a so called Dressing Station like Hotel Schoonoord or “Huize Tafelberg”. Here also surgical treatment could be applied because here the surgical teams of the 1st Airborne Division were established. The “Gelders Hof” estate was a modern house for those days, which had been built only a couple of years before. It was equipped with a large cellar which was excellently suited to be used as a hospital. Also various other facilities could be called excellent for those days, which made the job of the medics relatively easy. 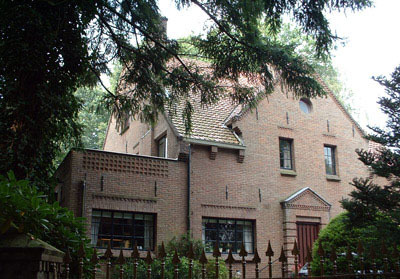 This again is one of the houses in Oosterbeek with quite a history, just like the whole area around it. Every house and estate has its own story and these will have to be safeguarded for the next generations! Please note: This house is private property and cannot be visited.